You are not currently tracking P.O.D. P.O.D. in 2008. From left to right: Traa Daniels, Wuv Bernardo, Marcos Curiel and Sonny Sandoval. Payable on Death (abbreviated P.O.D.) is an American Christian metal band formed in 1992. The band's line-up consists of vocalist Sonny Sandoval, drummer Wuv Bernardo, guitarist Marcos Curiel, and bassist Traa Daniels. They have sold over 12 million records worldwide. Over the course of their career, the band has received three Grammy Award nominations, contributed to numerous motion picture soundtracks and toured internationally. With their third studio album, The Fundamental Elements of Southtown, they achieved their initial mainstream success; the album was certified platinum by the RIAA in 2000. Their following studio album, Satellite, continued the band's success with the singles, "Alive" and "Youth of the Nation", pushing it to go triple platinum. In 1991, friends Marcos Curiel and Wuv Bernardo engaged in jam sessions, with Curiel covering guitar and Bernardo playing the drums with no vocalist. Calling themselves Eschatos, they started playing at keg parties doing Metallica and Slayer cover songs. After his mother's fatal illness, Sonny Sandoval converted to Christianity and was asked by his cousin, Bernardo, to join the band as a way to keep his mind straight as mentioned on their DVD, Still Payin' Dues. They got a bass player, Gabe Portillo, and eventually changed their name to P.O.D. After recording a demo tape, Traa Daniels joined the band in 1994 when they needed a bassist for some shows to replace Portillo. P.O.D. signed with Rescue Records, a label created by Bernardo's father, Noah Bernardo Sr., who was also the band's first manager. Between 1994 and 1997, they released three albums under the label, Snuff the Punk, Brown and Payable on Death Live. Longtime manager Tim Cook was first introduced to the band when he booked them to play his club The Where-House in Bartlesville, Oklahoma following strong local word of mouth support. He later described their performance by saying: "I stood at the back of the venue with tears in my eyes – it was the greatest thing I had ever seen." By that point, Bernardo Sr. was looking for someone else to take P.O.D. 's career further and so Cook took over as manager. Shortly after the release of Payable on Death Live, Essential Records offered P.O.D. a $100,000 recording contract, but on behalf of the band Sandoval told band manager Tim Cook to decline the offer because, "God has a bigger plan for P.O.D." When, in 1998, Atlantic Records A&R John Rubeli first came across P.O.D. 's demo he "didn't quite get it", as he later told HitQuarters. It was only when he saw them play live at The Roxy on the Sunset Strip and witnessed not just an enthusiastic audience singing every word but the center of a vibrant youth movement that he became convinced by the band. The band was quickly signed to a major-label deal. P.O.D. soon released The Warriors EP, a tribute EP to their loyal fans as a transitional album from Rescue Records to Atlantic Records. On February 19, 2003, guitarist Curiel left the band due to his side project, The Accident Experiment, and to "spiritual differences." However, Curiel claimed that he was actually kicked out of the band. Curiel was replaced by Jason Truby, former member of Christian metal band Living Sacrifice, and assisted with the recording of "Sleeping Awake", from The Matrix Reloaded soundtrack. In an interview with Yahoo! Music, Sandoval stated that Truby is the reason why the group is still together. On November 4, 2003, P.O.D. released their fifth studio album, Payable on Death, which saw the group shift from their well-known rapcore sound to a darker, more melodic metal sound. The album was hit with controversy due to its "occult" cover, which led as many as 85% of Christian bookstores across the United States to ban the album. With the help of the album's hit single "Will You" and "Change the World", it went on to sell over 520,000 copies and was certified Gold. Sometime after the tsunami in Asia, many singers, musicians, and actors/actresses, including Sandoval and Bernardo, participated in the recording of, "Forever in Our Hearts", with all proceeds going to benefit the tsunami relief. In a statement made by the band's manager on their MySpace page, it was officially announced, on December 30, 2006, that Jason Truby had left the band. They had said "God worked it out because Truby decided to leave the band the same day Curiel asked to rejoin." Curiel performed with the band for the first time since his departure on the 2006 New Year's Eve episode of Jimmy Kimmel Live!. Murdered Love was originally going to be released in June 2012, but was instead pushed back to July 10. The album was produced by Howard Benson, who also produced Satellite and The Fundamental Elements of Southtown. It was described by Curiel as "Back to our roots. A little bit of hip hop, a little bit of punk rock, or reggae". The band went on tour with Shinedown and Three Days Grace as an opening act. In mid-2014, P.O.D. announced an acoustic album to be released toward the end of the year. The album was crowd-funded on the website PledgeMusic. On October 20, 2014, P.O.D. announced a new record deal with T-Boy Records along with a new acoustic album. SoCal Sessions was released on November 17, 2014 and contained songs such as "Alive" and "Youth of the Nation". The band followed that release with another studio album, The Awakening, released on August 21, 2015, which was produced by Howard Benson, with guest vocalists such as Maria Brink of In This Moment and Lou Koller of Sick of It All. The band's name, Payable on Death (P.O.D. ), derives itself from the banking term "Payable on Death". The band chose this name to be a direct tie in with the Christian theology that explains that since Jesus died on the Cross, Christians' debts to God have been paid for; in other words all believers, in their acceptance that Jesus was sacrificed for them on God's behalf, have inherited eternal life with no strings attached. P.O.D. 's style has evolved over the years, from the rap metal sound on their early albums to the nu metal and reggae-infused alternative metal styles for which they're most well known. The band's seventh album, When Angels & Serpents Dance, is a combination of alternative rock, reggae rock and Latin-influenced metal with almost none of the rap metal or nu metal sound of their older releases. P.O.D. 's influences include Santana, Bad Brains, Bob Marley, Metallica, U2, Pantera, Rage Against the Machine, Beastie Boys, Black Flag, Faith No More, The Police, Jane's Addiction, Living Colour, Red Hot Chili Peppers, Sepultura and Suicidal Tendencies. Note: Album- and single-specific awards and nominations are listed under their respective articles. ^ "P.O.D. Biography". TodaysChristianMusic.com. Retrieved April 14, 2013. ^ "State of California Censors Christian Metal Band - The Gauntlet News". Thegauntlet.com. October 26, 2012. Retrieved April 14, 2013. ^ Udo, Tommy (2002). Brave Nu World. Sanctuary Publishing. pp. 10, 104. ISBN 1-86074-415-X. ^ Moberg, Marcus (2015). Christian Metal: History, Ideology, Scene. Bloomsbury Publishing. pp. 16, 39. ISBN 978-1-47257-986-7. ^ "Metal band P.O.D. stops by The Black Sheep". ColoradoSprings.com. Retrieved May 16, 2015. ^ Weiner, Natalie (16 October 2015). "No, Katy Perry Was Never P.O.D. 's 'Backup Singer'". Billboard. Retrieved 15 December 2015. ^ a b "P.O.D. - Artist Biography". AllMusic. Retrieved April 14, 2013. ^ a b Harvey P. Newquist; Rich Maloof (2004). The New Metal Masters. CMP. pp. 29–. ISBN 978-0-87930-804-9. Almost militantly Christian, the band wears religion on its sleeve. Its name is an acronym for Payable on Death, a term that highlights the concept that how you live on Earth determines where you live after you die. ^ a b Collar, Matt. "Payable on Death Review". AllMusic. Retrieved January 23, 2008. A darker album than its predecessor, Payable is built largely around Truby's precise slabs of distorted guitar. More quintessentially "metal" in his approach — think Metallica — and more of a conscientious technician than Marcos, Truby unfortunately lacks some of the unexpected spark that Marcos brought to P.O.D. ^ a b c d e MacKenzie, Wilson. "P.O.D. Biography". AllMusic. Retrieved December 4, 2007. ^ a b c d e "P.O.D. leaves Atlantic Records and Curiel returns". Blabbermouth. Roadrunner Records. December 20, 2006. Retrieved December 4, 2007. P.O.D. was with Atlantic for four albums and two EPs. The band signed with Atlantic in 1998, after selling more than 40,000 copies of its independently released EPs. The group's Atlantic debut, "The Fundamental Elements of Southtown", came out in 1999 and went platinum, while 2001's "Satellite" was a multi-platinum success. But the group felt that personnel changes at Atlantic were responsible for recent sales dips — more than 500,000 copies of 2003's "Payable On Death" were sold, but less than 250,000 copies of the recent "Testify". ^ Anonymous. "P.O.D.". San Diego Reader. Retrieved December 11, 2009. ^ a b c d "Interview with Tim Cook". HitQuarters. May 3, 2004. Retrieved October 11, 2011. ^ a b Joseph, Mark. "Promotion Crew: P.O.D. Biography". Promotion Crew. Retrieved January 4, 2008. ^ a b "Interview with John Rubeli". HitQuarters. Apr 7, 2003. Retrieved October 7, 2011. ^ Absolute TRL staff. "Rock the Party hits No. 1". ATRL.net. Retrieved January 4, 2008. ^ Powell, M. Allan (December 2002). "Jesus Climbs the Charts: The business of Contemporary Christian". The Christian Century. The Christian Century Foundation: 18–31. Retrieved Dec 12, 2009. ^ Moss, Corey (February 19, 2003). "Marcos leaves the group". Music Television. Retrieved December 4, 2007. ^ Cohen, Jonathan (February 19, 2003). "Guitarist Marcos exits P.O.D.". Billboard. Retrieved December 31, 2007. ^ "P.O.D. Cover Artist Speaks Out On Christian Ban". Yahoo! Music. December 8, 2003. Retrieved January 23, 2008. it's "ironic" that the album has been banned by 85 percent of Christian bookstores in the U.S., reportedly because the cover is "occult." ^ a b Cohen, Jonathan (August 11, 2006). "P.O.D. parts way with Atlantic Records". Billboard. Retrieved December 31, 2007. Hard rock act P.O.D. has parted ways with Atlantic Records, to which it has been signed since 1999. According to a statement sent to members of the group's email list, the group became disillusioned with changes at the label. ^ Jeckell, Barry A. (January 26, 2005). "'Forever' Unites Artists For Tsunami Relief". Billboard. Retrieved January 2, 2008. Recording artists from R&B crooner Brian McKnight to screamer Sonny Sandoval of rock act P.O.D. have lent their talents to a single that will raise funds for the tsunami relief effort in Eastern Africa and Southern Asia. ^ a b WWE staff report. "P.O.D. to play Mysterio to the ring at WrestleMania". WWE. Retrieved January 25, 2008. After the performance, P.O.D. will bring their unique sound to a new recording of Rey Mysterio’s “Booyaka 619” entrance theme. The band’s immense popularity is evidenced by its four No. 1 videos on MTV's program “Total Request Live,” which is an unprecedented achievement for a rock band. ^ MTV News staff report (February 13, 2006). "P.O.D. on tour". VH1. Retrieved December 17, 2007. P.O.D. will hit the road this spring with Pillar, the Chariot and Maylene and the Sons of Disaster as part of the Warriors Tour 2: Guilty by Association run. ^ "P.O.D. inked deal with Columbia Records". IGN Music. March 7, 2007. Retrieved January 2, 2008. The "classic" configuration of Sonny, Wuv, Traa, and returning original guitarist Marcos, who all last recorded together on 2001's Satellite, will begin working on a new album currently slated for a Summer 2007 release. ^ Laurie, Greg (August 6, 2007). "Saturday had the largest crowd from the three days". Harvest Crusades. Retrieved December 4, 2007. Music lent support to the talks presented by Laurie each night at the Harvest Crusade, reinforcing the message of God's love. From raucous hip-hop and rock from multi-platinum band P.O.D., to lively pop-infused music and dance steps from tobyMac, to an audience sing-a-long with the David Crowder Band, the Christian music represented at the crusade kept audiences on their feet. ^ "P.O.D. To Release New Album In April". Blabbermouth. Roadrunner Records. January 2, 2008. Retrieved January 2, 2008. Spiritual rockers P.O.D. (a.k.a. Payable On Death) released their new album, "When Angels & Serpents Dance", on April 8 via INO/Columbia Records. ^ "Rock Allegiance tour with P.O.D. and Red". Retrieved July 5, 2011. ^ "P.O.D. : New song available for free download". Roadrunnerrecords.com. Retrieved October 2, 2011. ^ "P.O.D. signs new multi-album deal with Razor and Tie". Payableondeath.com. Retrieved June 10, 2011. ^ "Listen to Brand New Track "Eyez" — P.O.D. Payable On Death". Payableondeath.com. April 5, 2012. Retrieved April 17, 2012. ^ "Murdered Love in NOISECREEP — P.O.D. Payable On Death". Payableondeath.com. April 6, 2012. Retrieved April 17, 2012. ^ ""Murdered Love" on POD's Official Website". Retrieved September 13, 2012. ^ Darby, Heidi (September 17, 2010). "POD and Norma Lopez". Lifeabove11.com. Archived from the original on April 5, 2011. Retrieved July 6, 2011. 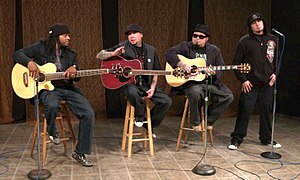 ^ "The SoCal Sessions - P.O.D.". ALLMUSIC. Retrieved February 17, 2017. ^ "P.O.D. 'S 'The Awakening' Is A 'Conceptual' Record - Blabbermouth.net". BLABBERMOUTH.NET. Retrieved May 16, 2015. ^ Alice Roques (2015-10-02). "INTERVIEW: Wuv Bernardo – P.O.D.'". RockRevolt Magazine™. ^ "P.O.D. win Echo Award 2003 (Germany) - 1st Major Music Award". YouTube. Retrieved August 5, 2010.